For most of my life, I’ve been a permanent full-time Nutmegger and a permanent part-time New Yorker (and vice-versa). However, starting in my teenage years, I began to get to know my immediate neighbor to the North-Western Massachusetts and the Pioneer Valley. As a child, I was always watching WGBY Springfield. Indeed, I have many fond memories of watching Square One TV on WGBY. Western Massachusetts also has a rich history. Although Boston is where the Revolution happened, the Constitution was born in Western Massachusetts when Captain Daniel Shays went marauding across the countryside. The Mohawk Trial has connected the Berkshires and Boston. There is also the Springfield Armory, Mount Tom, and of course, Norman Rockwell’s paintings. And, now, I hope to make my professional life happen in Springfield. And I could go on. But, since the topic is October, let me try and recall some visits there during that month. 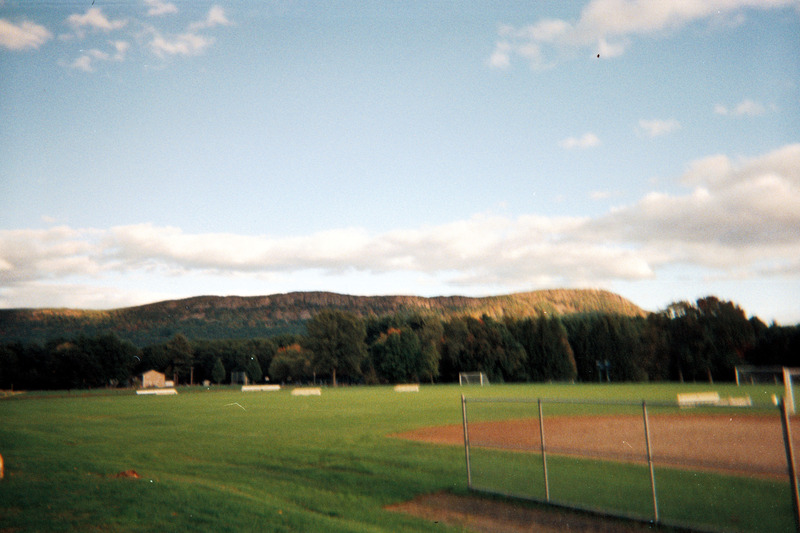 2002, 2003 (Part 1) and 2008 (Part 1): Williston-Northampton School sits, curiously enough, in Easthampton, Massachusetts. Williston is a member of the Founders’ League=an athletic league of prep schools in and around Connecticut and Massachusetts. And, if one is in another Founders’ League School, one invariably visits Williston to compete. Such was where I found myself circa October 5, 2002. I had just joined the Cross Country team at my alma mater, Kingswood-Oxford. We had a meet up in Williston. It was a bright and sunny fall day, and there was a crispness to the air, but, the sky was alive. We unloaded from our vans, and set about a coursewalk-which is to orient ourselves to the where we will be running. The course passes through woods, sandpits, some uphills, some downhills, and through open fields. We proceeded through our warmups and the rest of the preparations. The race was off-and I was into the woods and through the hills and parkland. I was never the fastest runner. Indeed, in every race I ran, I was dead last. But I did not run to win. I ran as a challenge, inspired by one of my coaches. And Cross Country and the camaraderie there was refreshing therapy from the tragic death of my writing mentor, Kristina Stahl. Well, despite the coursewalk, a curious thing happened to me! I became lost and ran in circles. I was stuck between the sand pits and open fields and the woods at the two mile mark. I don’t know how long I circled, but, I was in a curious netherzone of the Western Massachusetts woods. I finally found my way out, found my hero coach, and finished the race. I would return to that race course but not compete in 2003. There is an invitational and the New England Championships were held there in October and November (d’oh!). What I remember most vividly is that I was assiting in how the race was run-almost an adjutant coach. I followed people on the course, made sure they had water and apples, and tracked progress. Five years later, I returned again, this time, strictly as a spectator. It was a bright sunny day-and it was post-standardized test relaxation. I remember the drive up vividly-and how it compared to the original drive up in 2008. Route 141, the connection between Easthampton and Interstate 91, is a lengthy, windy road through Mount Tom. One climbs, follows a long set of curves, and eventually reaches a peak and a vista of Easthampton below before winding and wending west down towards Easthampton and the Manhan River. I’ve often wondered what that drive is like during winter-and if Route 141 gets closed during the season. That October Saturday, the sun and the clouds were magnificent, and the leaves were just starting to change. And I had a convertible. Ah, what a wonderful drive. And, of course, a hero’s welcome for an alumnus racer. 2003, Part 2: I was very fortunate when I was learning how to drive that my father would come with me while I learned. Well, that same month of October (albeit earlier) we drove up to Granville. The leaves were out, it was a sunny day, and it was a reward for me finishing my college application. We stopped for Granville Cheese-which is some of the most delicious cheddar on Earth. Home aged in recipes that go back hundreds of years, the cheddar has a rich and full flavor-and multiple varieties. We stopped and bought cheese, having just missed the opportunity on our last trip up to Massachusetts (at the junction of Route 57 and Route 189 on the Town Green) and kept going. Route 57 is another interesting and beautiful drive. The road connects Springfield to the Berkshires via the southern towns. Route 57 curves through Granville via Sodom and Cobble Mountain, in the former, there are ravines, in the latter, 20 mile per hour curves. One then reaches West Granville, marked by a tiny firehouse and a church-and Granville State Forest. Route 57 then begins a long spiral towards the Clam River, which flows into the valley of the West Branch of the Farmington River. The long spiral culminates in a runaway truck ramp into New Boston before heading to Sandisfield. And such was where Dad and I headed. Dad had driven the runaway truck ramp before. I hadn’t. But I handled it well. And, we boldly pressed on through the woods to Sandisfield proper. What I remember is that Route 57 becomes progressively more rural until you feel like you are the last people on Earth among the foliage in the woods of the Lower Berkshires. Yet we pressed on to this new frontier. 2004: There is a very curious independence one acquires when one goes away to start college. It’s empowering and emboldening. 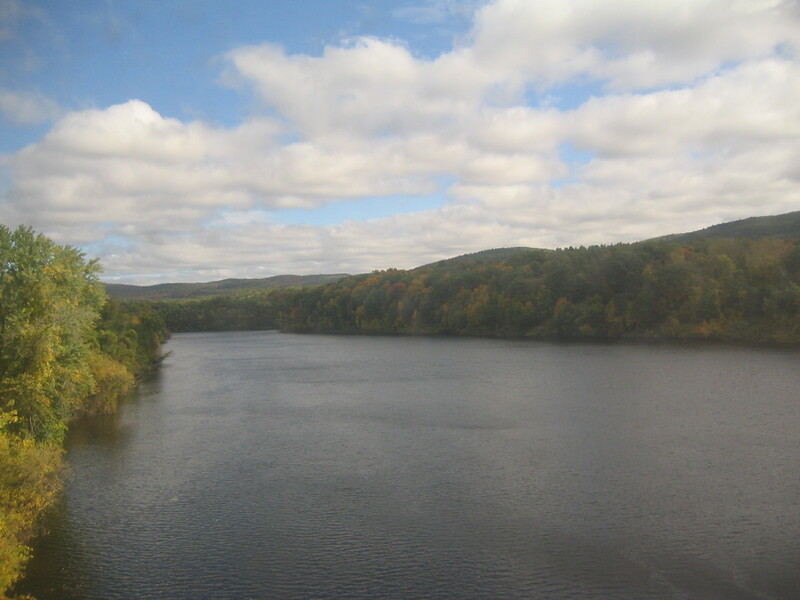 That October, Columbus Day weekend, I arranged to visit my Uncle from New York in New Hampshire via Amtrak’s Vermonter. It was a historic first-not only was I taking the train for the first time up that way but also the first time I went north of Windsor, Connecticut. I boarded at 11 in Penn Station-by 2 we were in Springfield. I stepped out into another day tinged with grey and sun. The air was crisp. But the fun had just begun. One has to leave Springfield for Palmer to switch to the New England Central, which runs to St. Albans, Vermont. The ride there is through an industrial area, marked with junkyards and factories. In Palmer, one arrives at a beautiful antique railroad station for a backwards switch. And then one is lost in the Massachusetts woods near Quabbin for a long time, passing through Three Rivers and the villages that follow. The ride is idyllic and beautiful-paralleling country roads, open fields, and of course, ample and full foliage. It’s a wonderful place to have lunch, study, and get to know your fellow passengers-especially a kindly elder gentleman who volunteers as a Parks Service Guide. Amherst passes on by-but you don’t really see much of the town. Finally, one emerges in East Northfield at the Connecticut River to the bridge with mountains to the north-and right at the state line with Vermont, a person on horseback waiting to cross the tracks. What a ride. 2008, Part 2: Another Columbus Day weekend saw me heading back to Granville. I had a free Friday and I was determined to enjoy and soak up the foliage. So, I drove up-but started in Southwick-home to one of the gems of the Pioneer Valley-the Summer House. 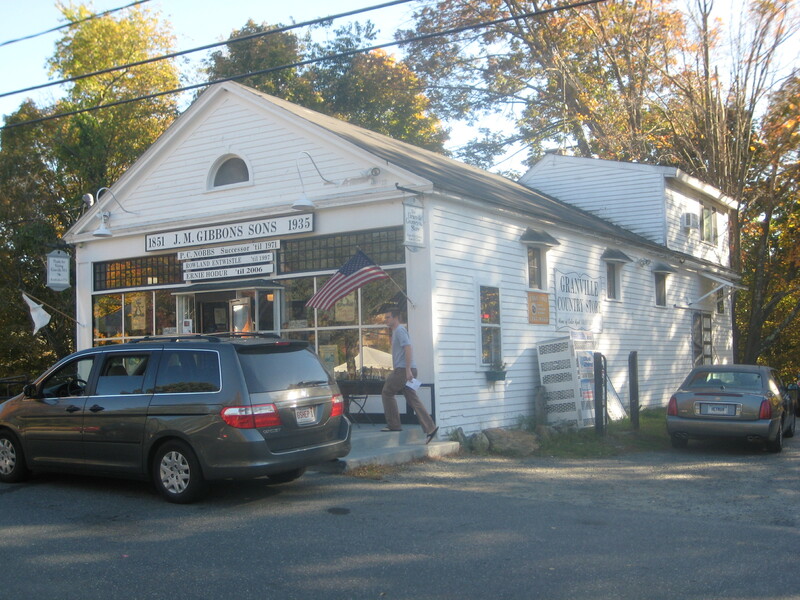 Situated right on College Highway (the former New England Interstate Route 10, now Connecticut-Massachusetts-New Hampshire Route 10), the Summer House serves wholesome roadside food and ice cream. In the former category, this includes Burgers, flavorful Onion Rings, Grilled Cheese, and Chili-what would be considered Fast Food and likely punished criminally by Mayor Bloomberg and Upper East Side mountebanks…But I digress. Much like ’08 Part 1, I drove my beloved Jadzia up College Highway to the Summer House for ice cream and roadside and back out Route 57 to Granville. As luck would have it, not only was Granville full of bright and colorful foliage, the Harvest Fair was celebrated that weekend. I bought cheese and hung out a little with the locals, who were preparing pies (which I think I bought-whenever I drive out to the countryside, I buy pies, in the spirit of Seinfeld) and had a tag sale. From the Granville Country Store, I drove out to North Lane, where there is a nature preserve and reserve-with an incredible view for 70 miles around. I had not been there in years-but it was great to return. Indeed, a la Andy Dufrense, I almost buried money for someone up there. This time, rather than head out to Sandisfield, I continued up North Lane into the woods of Granville-after a short trip to West Granville. There are houses along the side of the road, but, eventually, one truly leaves civilization behind-until one reaches the Cobble Mountain Reservoir-the primary water supply for the City of Springfield. Getting into the woods is easy. Getting out is hard. The roads lose their pavement and are narrow. There was a truck approaching, and I stopped and backed out to let him pass. My Jadzia handled the woods beautifully and the dirt-although, I wasn’t sure I’d get stuck. And, as fate would have it, I wound up in Blandford at Route 23. Now that’s an interesting drive. Winding through the eastern edge of the Berkshires, Route 23 passes between Mountains before connecting to Route 20 in Russell-which also winds and wounds along the Westfield River. Both roads are pock-marked with the occasional villages but otherwise remain quite rural. Lots of foliage and woods-The boundary into civilization is a trussed overpass under the Massachusetts Turnpike near the Westfield City Line on a downhill. And I had a wonderful drive with the top down. I followed Route 20 out to Route 187, which connects Westfield to the City of Hartford via Blue Hills Avenue, Bloomfield, East Granby, Suffield and Agawam. And that was where my trip ended. So, what’s my bottom line? Well, the month of October is fondly associated with traveling through Western Massachusetts for me-and what a place it is to travel through. And, such is what I remember-including making new memories in 2012. From cities to mountains to foliage alike, with great places to visit, like Easthampton and Granville for its cheese, I cannot think of a more scenic locale to take in the month of October. Joe Schneiderman is a writer and law student based in New York.